Cutco Table Knives crafted with Double-Edge® and comfort handle. Presented in an attractive gift box. 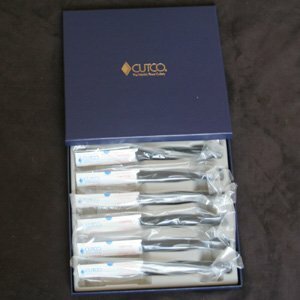 Cutco is one of the largest manufacturers and sellers of high-quality cutlery in North America. With over 14 million satisfied customers, Cutco recorded sales of over $150 million in 2005. Cutco offers a forever performance guarantee, a forever sharpness guarantee, and a forever replacement service agreement for misuse or abuse. Experience the difference with Cutco's quality cutlery! This item is a great gift idea. If you have any questions about this product by CUTCO, contact us by completing and submitting the form below. If you are looking for a specif part number, please include it with your message.